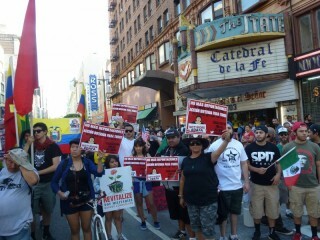 LA May Day march demands: No more deportations, legalization for all | Fight Back! 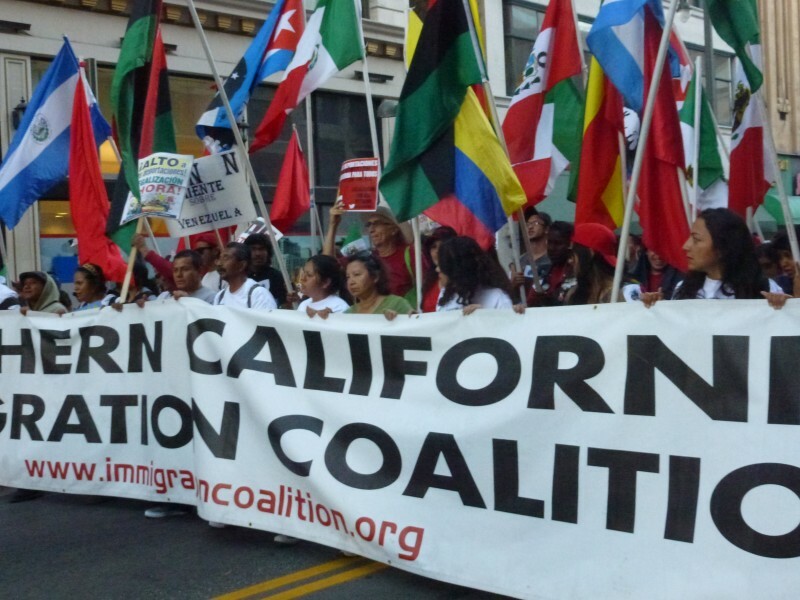 Los Angeles, CA – On the afternoon of May 1, a powerful May Day march, organized by the Southern California Immigration Coalition (SCIC), took place in the heart of downtown as many garment workers were leaving work. The highly spirited 1000-plus crowd was made up mainly of working class Latinos, union members from Roofers Union Local 36 and United Teachers L.A., street vendors, daily laborers, families and high school students. Also joining the march and helping to carry the lead banner were the women and men of the homeless shelter Projecto Pastoral in Boyle Heights. The SCIC is composed of dozens of groups including the International Action Center, Community Service Organization, Union del Barrio and Bayan USA. SCIC is an independent grassroots coalition that receives no government or foundation funding. The many speakers called for Obama to stop the deportations and demanded legalization for all. Many denounced the police/ICE abuses such as detentions, deportations and deaths at the border. Bayan USA denounced U.S. imperialism and its intervention in the Philippines and other countries. Ramon Mendez, a member of Roofers Union Local 36, spoke about being harassed and exploited at work, and when he filed a grievance the boss called the ICE on him. Mendez had to live away from his family until others came to his aid, pressuring ICE to respect a labor neutrality agreement with the Labor Department that protects workers who are in disputes with employers. He is now out on bail, fighting his deportation. The MECHA students talked about the need for legalization and better schools. Carlos Montes, a veteran Chicano revolutionary, stated that the fight for legalization is part of the struggle of self-determination for the Chicano/Mexican people and equality for Latinos. He noted that May 1 had been revived in the U.S. by the massive 2006 immigrant rights marches led by Latinos. The spirited march included flags from Latin American countries, including the Chicano nation of Aztlan. 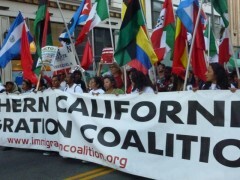 Two other May Day marches took place in Los Angeles on May 1.